The parks of Shanghai are a marvel to walk through on a week-end: there are numerous social gatherings, with people playing cards, mah-jong and other games, people doing tai-chi or practicing kung-fu, and people dancing. When I walked in Xiangyang park that particular sunday, I saw the pavillion at the back and the naked trees with everyone dancing in front and I knew I had my shot. 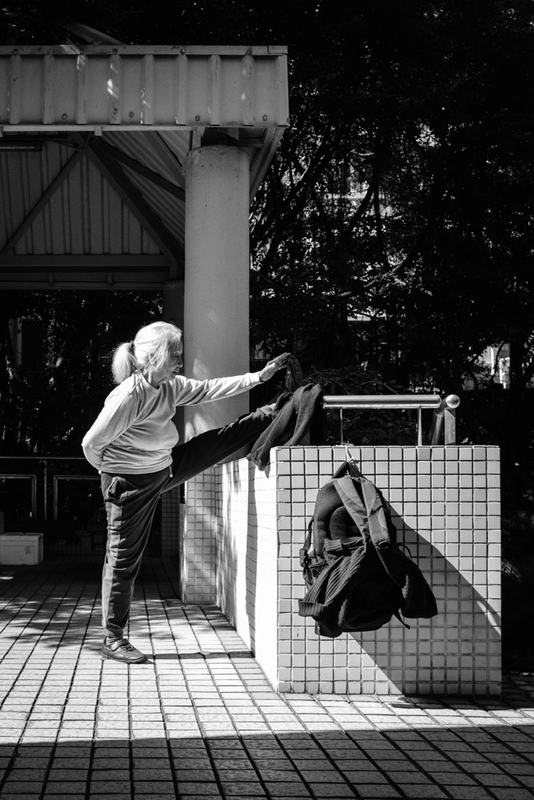 Gymnastics is very important here in China, especially for elderly people. I was impressed by this grandma stretching though, because I’d be incapable of putting my leg up that high!